Just a quick progress update, in the form of a couple more “monster” cards for Kerkerkruip. 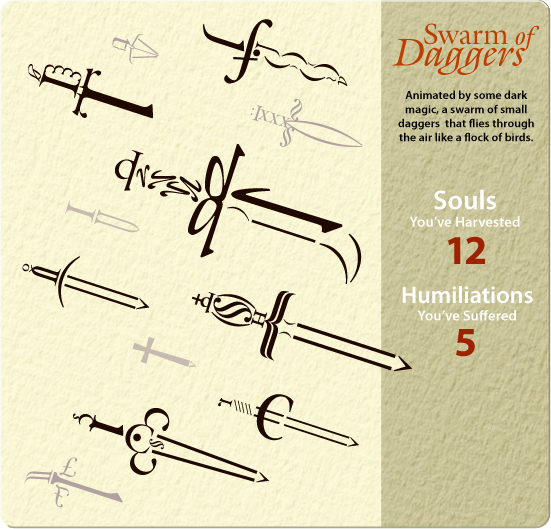 The swarm of daggers is on a background of textured, cream-colored paper. The daggers are collaged using Galliard, a typeface that was quite popular as a text face in the 1980s and 1990s, but harkens back to Dutch designs of the 1500s. (The name refers to a vigorous, leaping dance of the 16th century.) Galliard has lots of daggery-looking glyphs, with sharp angles and calligraphic strokes, so it seemed appropriate. 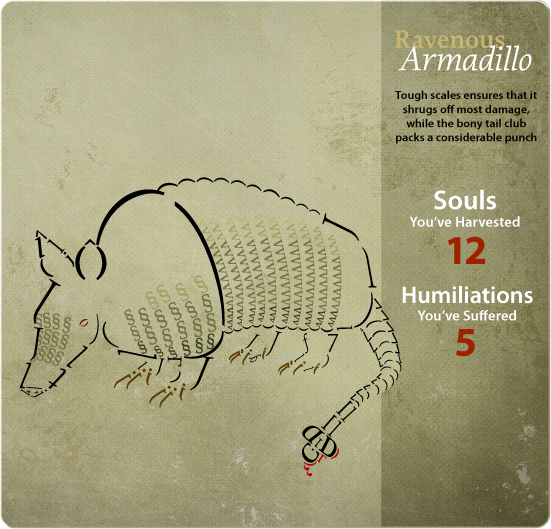 The Ravenous Armadillo, which happens to also have the clubbed tail of an ankylosaurus, is pictured on greenish canvas. (A giant armadillo with a clubbed tail is certainly more frightening than the standard hillbilly speedbump we’re used to here in the US.) The armadillo is rendered in another font with Dutch origins, Proforma. The markings on an armadillo’s armor are interesting and I didn’t want to lose them in collaging the beast into type, so I’ve experimented with color-gradated textural glyphs in addition to the main outlines. OK, swerving to a new topic: I am considering setting one of the characters from Kerkerkruip in a non-Western face. Perhaps Malygris in Arabic? Suggestions of typefaces and characters to match them with are welcome!